A few years ago, I took the train from Ottawa to Toronto. For whatever reason, I became transfixed at this portrait of Toronto’s city hall mounted to the front of the passenger car. I started at it for a minute or so and then suddenly saw why I have become fascinated by it: the very architecture of Toronto’s city hall so perfectly represents Toronto and Torontonians. This edifice consists of two concave towers built in like a fishbowl relative to one another. But curiously, all of the windows are built on the inner-concave sides so that the two towers look upon each other, while the outer-concave sides of the two towers are covered in a brutalist concrete facade and have no windows at all. 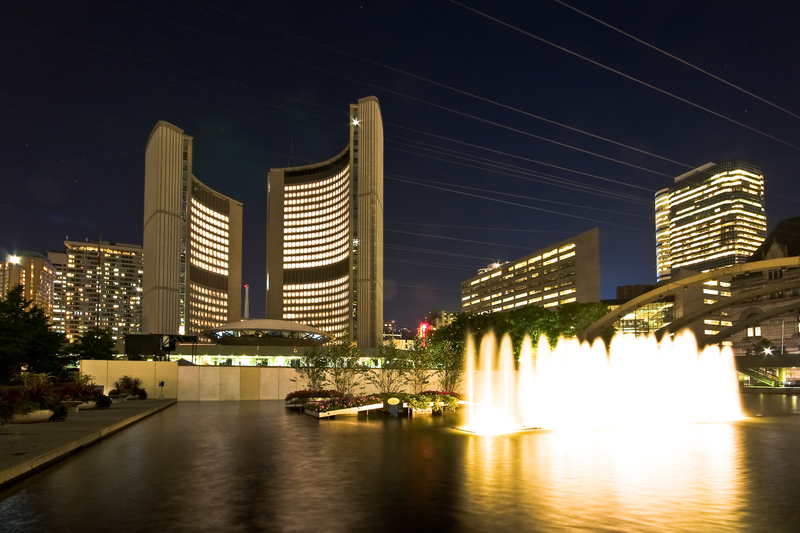 So, what is Toronto’s city hall? This building is open only to itself, whose large windows face only the other tower so that the city hall can marvel upon itself and become enthralled with itself, and it remains completely closed off to the rest of the world, to which it presents a brutalist, expressionless concrete wall — as if the rest of the world were unimportant because Toronto is the center of the universe. That is why Toronto’s city hall so perfectly represents Toronto and the attitudes of Torontonians. Furthermore, I imagine that anyone who is not from Toronto will find this post funny, while Torontonians themselves would at first instinctively recoil in disgust and then find me obnoxious and petty for having made this observation. This entry was posted in Humour & Satire. Bookmark the permalink. You could also add that the two towers being separate represent the urban and rural divide that has plagued the metro since amalgamation. Correct on all accounts, James!